Dated 1761 (bothy ranges); circa 1771, pineapple crown. 2-storey bothy ranges, harled with ashlar dressings. 6 windows to upper storey to garden front, loggia at ground outer elevation, with folly at centre. 2-stage folly, pedimented classical loggia at ground to garden and octagonal upper stage above flanking ranges, with Gothick windows and elaborate pineapple crown of masonry with exhuberant fronces and finial sited at head of large walled garden. Before 1973 very run down and vandalised but acquired that year by Landmark Trust as restoring tenants and converted, now let by Landmark and owned by National Trust for Scotland. 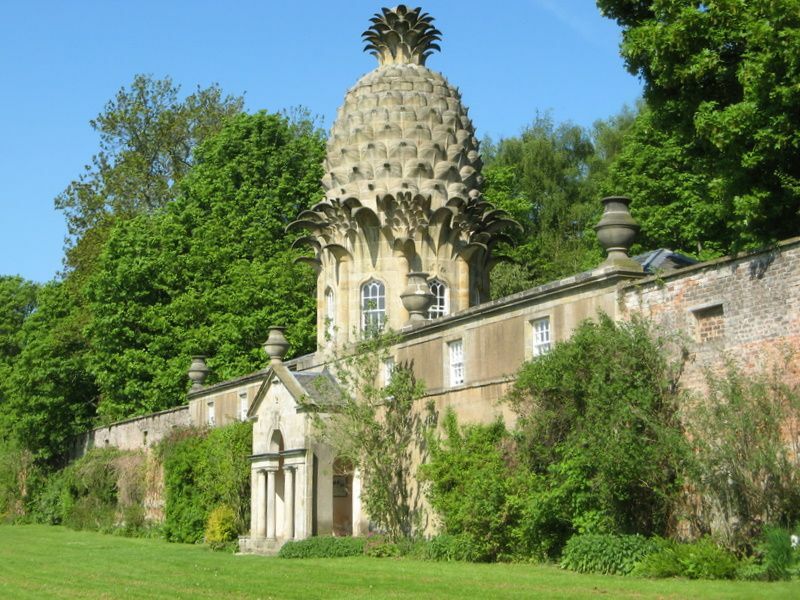 Built by the Earl of Dunmore, it is thought the addition of the pineapple crown came after his return from service as Governor of Virginia, to act as a fanfare marking his resumed occupancy of the estate. De-scheduled 3 March 1999.